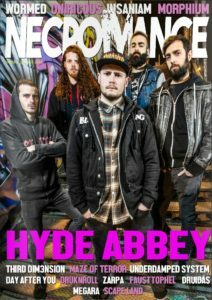 Welcome to Necromance Digital magazine, can you divulge upon us a brief history of the band? Andrew: Thanks for invitation! Everything started 10 years ago when I decided to engage myself in music though I didn’t have any experience in recording and playing in a band. I invited vocalist Horror, drummer Petr for the record and recorded other instruments by myself. For this I had to create my own recording studio METALHEARTS not to be interrupted from creative process by anything. So, by trial and error, the first full-format album was released in 2010. Later we were joined by multi-instrumentalist Knip and we have recorded 3 more albums during 6 years. What’s the story behind your new album “In the game”? Can you give us some context about this release? Andrew: History of new album is as old as Adam! Right after the release of the album “Boiling point” in 2014 our team segued to recording of new album “In the Game” without any breaks and vivid interest of listeners, positive responses of musical critics only accelerated this process. Between ourselves, now we work on new album and by the end of this years or in the beginning of the next year we plane to release EP and video clip on one of the songs. Was it hard to write such songs on “In the game”? Do you ever suffer from writer’s block? Andrew: It’s not difficult to write songs for an album, one can even say it’s easy but there is one minus. It’s always mind blowing, the desire appears to gnaw bare wire under the voltage 1000 volts and beat head against the wall. Were there any songs for “In the Game” that were especially hard to finish? Andrew: No, we don’t have problems with this, everything is going smoothly. I can’t understand people who have 3-5 versions of one song, they choose suitable variant, delete or finish off something. We create one variant and don’t change anything in songs. And I can’t understand those musicians who make difficult choice – to select only ten songs out of fifty. How does the songwritting process typically work? has it changed at all since the band formed? Andrew: I can say that our work process has been formed during the years and hasn’t changed until now. We don’t take up few songs at once, we take one and make it completely for 2-3 months. So, during couple of years we create material for full-format album. Speaking of music, who are some of your more prevalent influences? Alexander: Regarding vocal, it’s difficult to tell that there is influence of one or two bands. I always tried no to resemble anyone by stylistics, at least I didn’t copy one or another vocalist. It was more like collective image of such guys as как Peter “Peavy” Wagner (Rage), Mikael Sehlin (Degradead), David Draiman (Disturbed), Andi Deris (Helloween), Anders Fridén (In Flames) and many other no less or even more famous names. What are some of the themes and lyrics on the album? Andrew: We don’t make conceptual albums. Theme of the songs is very different. Regarding themes and songs in album we resemble akyn-poet-improviser in Turkic speaking people whose main principle is philosophy: “I sing what I see!”. Of course, it’s a joke. Looking back on your career, what do you think of your debut album now? Alexander: I always liked our first album, this is like first love, it will never be forgotten. Of course, if to look back, I would sing some songs differently, may be better)), and some of them i wouldn’t change at all, everything is said there!!! Andrew: This reminds me darts game. The direction is chosen right but at first you miss independently of how many times you try! But then you begin to work, train and the dart flies more and more precisely. And then the time will come when you hit the ten! How do you feel compared the new release to your previous albums? Alexander: New release should always be better and more interesting. We grew up, the world changed, we changed, so it turned out that these are WE but we sound differently, not like in the last release. Are you excited to be presenting your album to fans on live shows? Andrew: At present moment we don’t lead concert activity, we are completely focused on studio work. One of the reasons is that I play few instruments in the group simultaneously and I’m not ready to trust my parties to anybody but we can be seen in the clips which we issue periodically. Recently we released our new video clip under the name «Wolf». Alexander: I would like to wish everybody to live full live, to listen to good music, to go to cool concerts and take care of our Earth since we still live on it! !